Vescent laser and electro-optic control electronics provide the lowest noise, highest bandwidth, and most flexibility of any commercially available products. From laser current drivers with a noise density of less than 100 pA/vHz to laser servos with full PI2D loop filter reconfigurability, our unmatched performance is designed for the most demanding AMO research. Vescent understands that "excellence by design" begins with the electronics for any lab. After several years in development, the first in a new range of Slimline ICE (SLICE) models was launched by Vescent Photonics at CLEO'17. The SLICE-QT is a four-channel temperature controller for thermally stabilising a laser, photonic device, or non-linear crystal. It is compatible with both TECs and resistive heaters, and features auto tuning along with 40 watts of control power available to the user. The D2-005 is a stand-alone, quiet, linear power supply providing ±15 V and 5 V. Isolated from line and EM interference, one power supply can run two complete laser systems or four electronics modules. The D2-005 is Rackless Rack compatible. 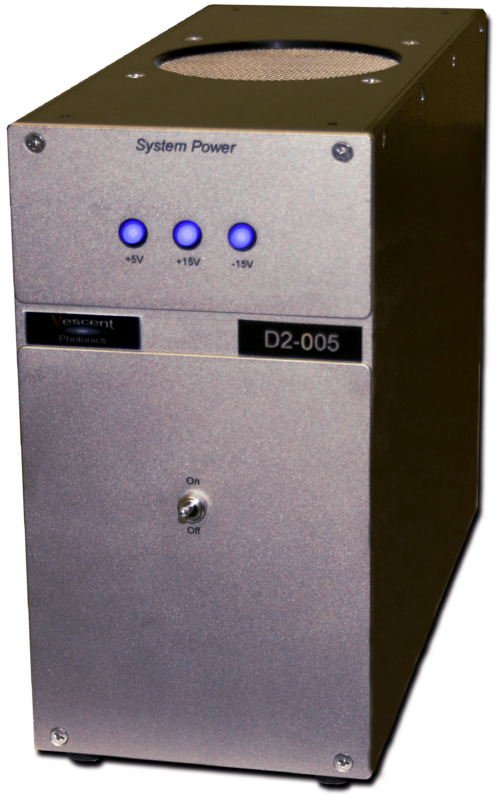 The D2-105 is a precision diode-laser current source based on the Libbrecht-Hall circuit. With a current noise density < 100 pA/vHz, the D2-105 has lower noise than any other commercially available laser controller. This ultra-low current noise is ideally suited for precision spectroscopy and metrology applications. Furthermore, two-stages of temperature control provide sub-mK stability, ensuring long term frequency stability. A front panel current servo BNC enables high-speed (> 10 MHz) servo control of the laser's frequency. 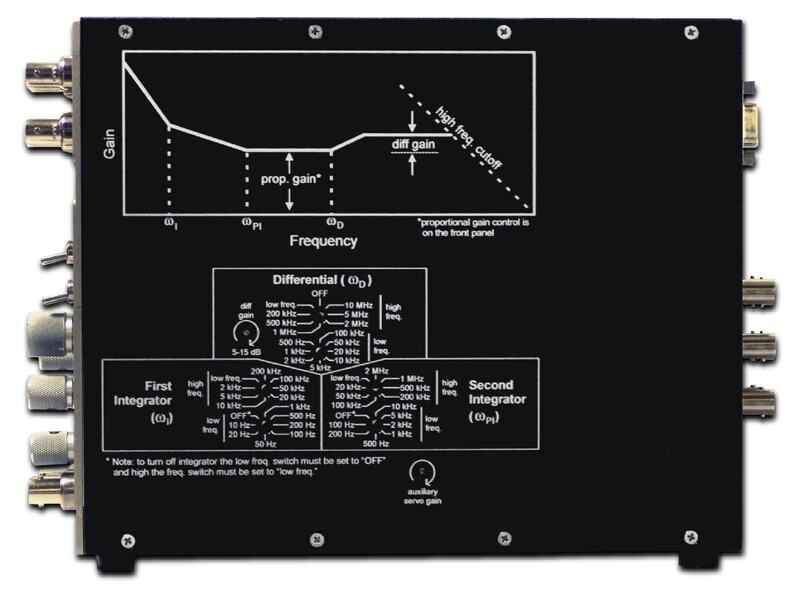 Additionally, extremely high speed modulation is enabled by a front panel RF port, which is connected directly to the laser current output SMA. This enables the user to directly write sidebands onto the laser via injection current, which can save the use of expensive AOMs, EOMs, and lock-in amplifiers. To keep line frequency harmonics off the output current, the D2-105 is powered with either an external power supply (D2-005) or user provided power via a breakout board (D2-001). The D2-105 is Rackless Rack compatible. The D2-125 laser servo is designed for low-noise servo control of lasers and other experimental systems. The PI2D loop filter, with two-stage integral feedback, provides tight locking to cavities and atomic/molecular transitions. 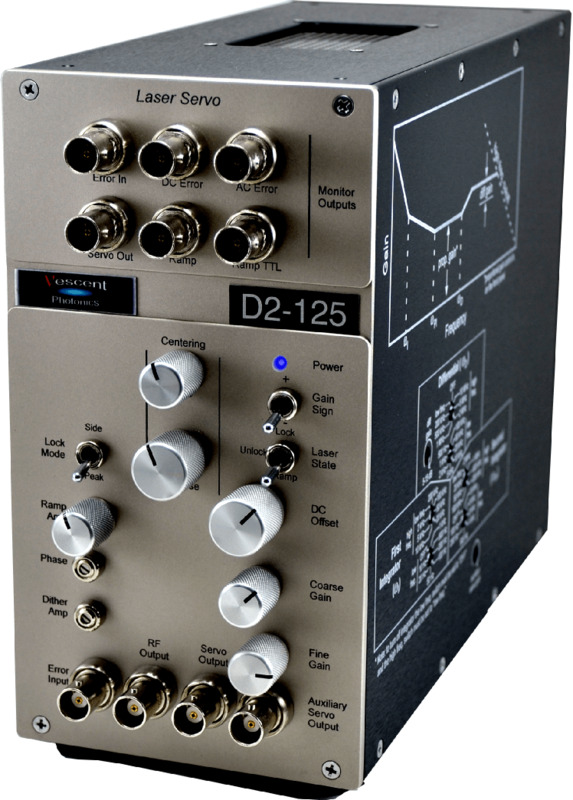 The D2-125 provides full user-control over the loop-filter parameters, enabling servo-loop optimisation for a wide variety of systems such as: acousto and electro-optic actuators, voice coils, piezo actuators, and so on. The D2-125 is designed to integrate into the Vescent Rackless Rack concept. As such, it may be powered with the D2-005 or from an adjacent D2 electronics module. If used as a stand-alone product, it may be powered either externally (with a D2-005 or from a user supplied power supply via a breakout board) or it may be ordered with an internal power supply and simply plug into a standard wall socket. Auto relocking is available for the D2-125 Laser Servo as an option. Lock Guard™ detects when the servo loop filter has gone out of lock and automatically recaptures it. When it detects an Unlock Point (a fast change in the servo output), it disengages the servo and holds the output at the last known valid value. Lock GuardT then waits for a Hold Time before re-engaging the lock. If, during the Settle Time, it detects that the system is still out of lock it will try again. Lock Guard™ control parameters are all user adjustable for maximum flexibility and optimal performance. The D2-135 Offset Phase Lock Servo (OPLS) is designed to precisely control and quickly adjust the frequency detuning between two lasers. The D2-150 Heterodyne Module conveniently enables the overlap and fibre coupling of two laser beams. This mates with a FC fibre connector on the D2-135 providing an easy optical input for the beat note. Alternatively, the fibre connector can be exchanged with an SMA to input an electronic beat-note. The D2-135 OPLS provides full servo-loop customisation for optimisation to most lasers. The D2-135 is designed to integrate into the Vescent Rackless Rack concept. As such, it may be powered with the D2-005 or from an adjacent D2 electronics module. If used as a stand-alone product, it may be powered with either a D2-005 or from a user supplied power supply via a breakout board. In the above video, a ball of fluorescing ultra-cold rubidium atoms are caught in a magneto optical trap (MOT). The frequency of the trapping laser is detuned by playing the music through a Vescent Photonics D2-135 Offset Phase Lock Servo, causing the number of trapped atoms to vary.